Embroidered Boating Clothing and Gifts. Personalized Life Rings Make Great Gifts. Coast Guard Approved. SS Graphics, Inc. must give approval for return of merchandise. Not all products may be returnable. SS Graphics, Inc. must authorize the return of any merchandise. Returnable merchandise may subject to a restocking fee. All items to be returned require a Return Authorization Number(RA). RA numbers must be requested within 15 days of receipt of product. Product must be in new and unused condition, with original packaging to be considered eligible for a return. Please speak to one of our customer Service Representatives prior to making any return. 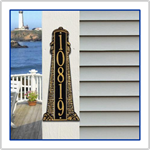 Custom Signs and Imprinted Items are non-refundable. Prices and specifications on our website are subject to change without notice. We reserve the right to correct typographic errors. Freight/shipping charges will be added to all orders. Common Carrier/Motor Freight Shipments are subject to crating/boxing charges. The original and return shipping and handling charges are not refundable. Please mail your package in a prepaid, insured, traceable method to the address provided to you by your Customer Service Representative. Your Customer Service Representative may be reached via email or by calling 1-800-513-1695. Serving Recreational Boaters Online Since 2001.